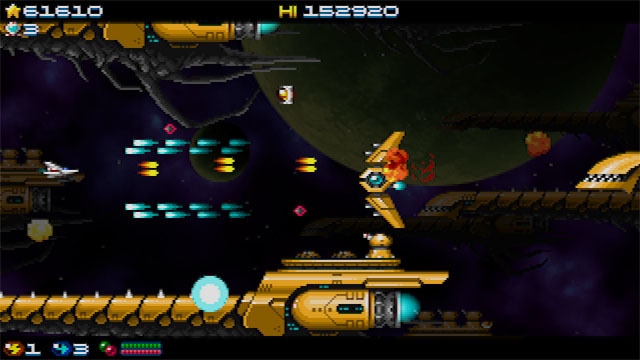 Super Hydorah is an updated and expanded version of the original Hydorah, a freeware game from Locomalito. The new game is a partnership between Locomalito and Abylight Studios, following their release of Maldita Castilla EX: Cursed Castilla, an expanded commercial release of Maldita Castilla, a Ghosts ‘n Goblins-inspired actioner. Super Hydorah is a horizontal shmup inspired by genre entries of the early 80's, but offering nonlinear gameplay that allows players to take different routes to complete the game and reach one of several endings. The original game was a single player experience, but the new one can be enjoyed locally in 2P co-op. In addition, the number of levels, bosses, enemies, and weapons has been increased over the original game, offering even veteran players something new to experience. The new game also offers bonuses based on level rankings, as well as CRT-style filters and various graphical improvements. The game is now available for PC via Steam and Xbox One via Microsoft Store.